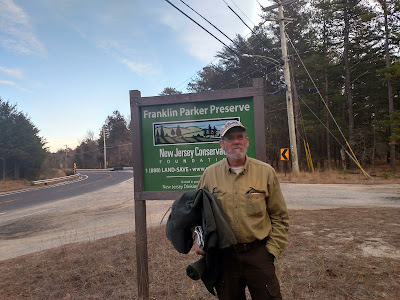 Senoir Land Steward Russell Juelg at Franklin Parker Preserve. 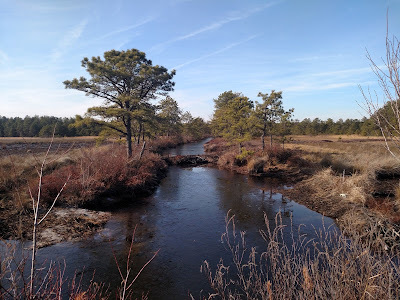 For centuries the Pine Barrens of New Jersey were mostly undeveloped due to their sandy, infertile soil. Beginning in the late 1800's however, cranberry farming became a major industry. 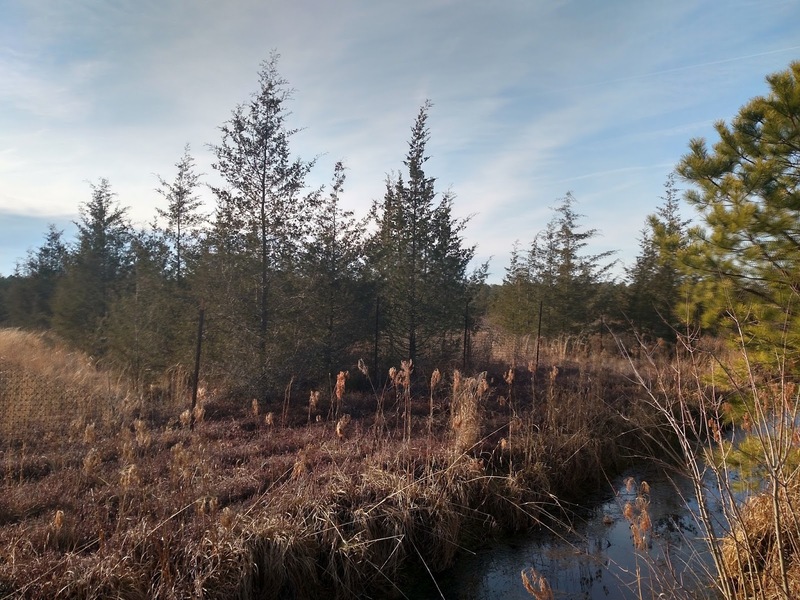 Cranberry bogs replaced much of the region's wetlands, ecosystems rich in biodiversity, habitat to over 50 endangered or threatened species. 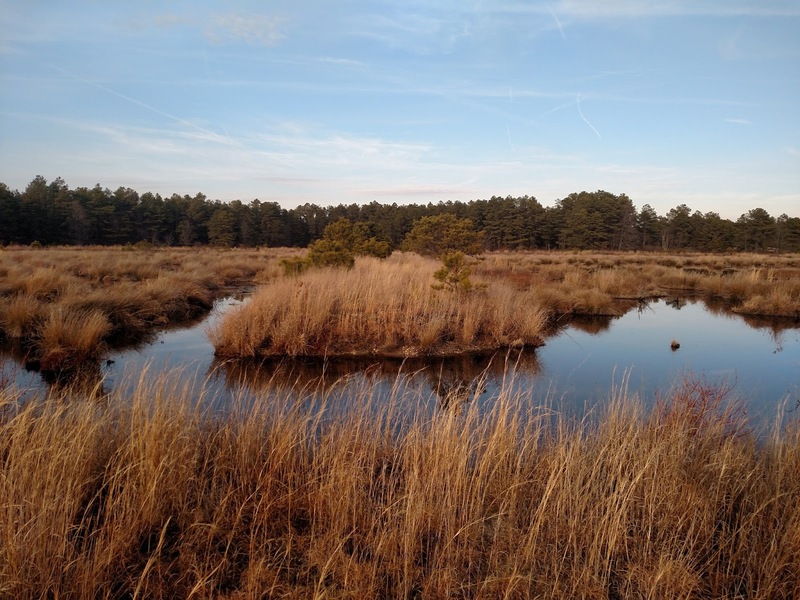 At Franklin Parker Preserve, the New Jersey Conservation Foundation (NJCF) has restored 1,100 acres of cranberry bogs back to diverse wetland communities, the largest wetlands restoration project in the northeast. Russell Juelg, Senior Land Steward at NJCF, took me on a tour of the restoration site. Flanked by wetlands on both sides, we drove along the sandy dikes. Cranberry farmers built them in the 1940's, and over the farm's 60-year lifespan the dikes served both as vehicle access and water level control. Culverts beneath them moved water from one bog to the next (pictured above). In each bog were rows of cranberry vines which were flooded periodically for irrigation, harvest and frost protection. We stopped at Bertha Canal, the farm's main water source connected to nearby Chatsworth Lake. Russel picked and handed me a few cranberries – a native plant that still flourishes along the dike's edges – and explained the project's history. NJCF purchased the land in 2003 and completed the restoration work in 2011. Now the bogs are mosaics of water and native plants, home to endangered and threatened species such as timber rattlesnakes, pine snakes, pine tree frogs and barred owls. Studies have shown increases in their population since restoration, according to Russell. From his experiences with the project he also shared the following key insights. Aerial photos, 1930 (pre-farm) vs. 2006 (post-farm). 1. 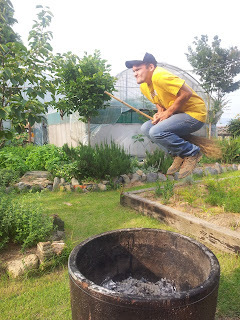 Native soil regenerates native plants. While the conversion from wetlands to cranberry bogs was ecologically destructive, it was technically simple. Farmers moved earth to flatten and dike each bog, but otherwise soil conditions remained the same. Pine Barrens' sandy, low nutrient, low pH soil was already well-suited to cranberries. This simplifies restoration. Compare this to other sites, like the cornfields of Iowa, where decades of fertilizing, pH amending and plowing has altered conditions in favor of opportunistic invasive species. Here at Franklin Parker the only non-native species are along the diked roadways possibly from imported soil and gravel. The wetlands regrew with native plants, mostly from the seedbank. Volunteers and staff also planted 35,000 Atlantic white cedar in several locations. Since farmers leveled each bog to ensure even flooding and draining, a major restoration task was dig shallow pits and build low mounds. The goal was an "undulating surface," Russel says. 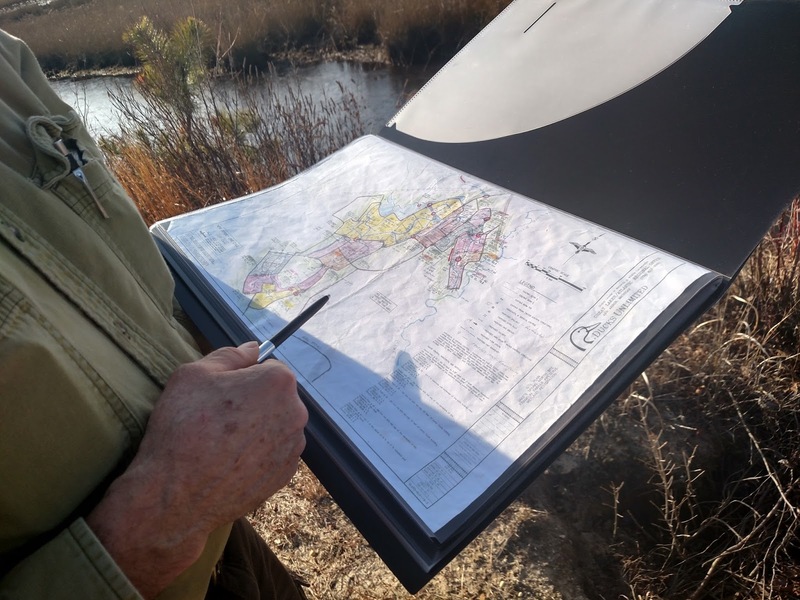 Like we've seen at coastal prairie restoration projects, this diverse "microtopography" creates diverse plant and animal habitat. Diverse hydrology also helps. 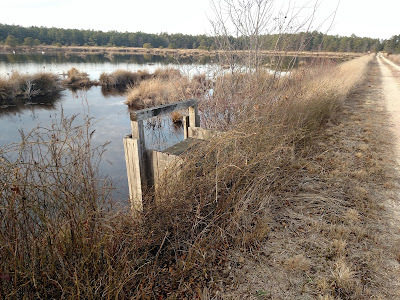 Removing old water control structures and adding spillways allows variations between bogs, some mostly wet and others mostly dry, between 80 to 20% open water. Breached dike allowing more natural water flows. Fire is key to the Pine Barrens ecosystem. It recycles nutrients, promotes diversity by opening space for early successional plants, and shapes the overall forest composition, such as favoring pitch pine over oaks. 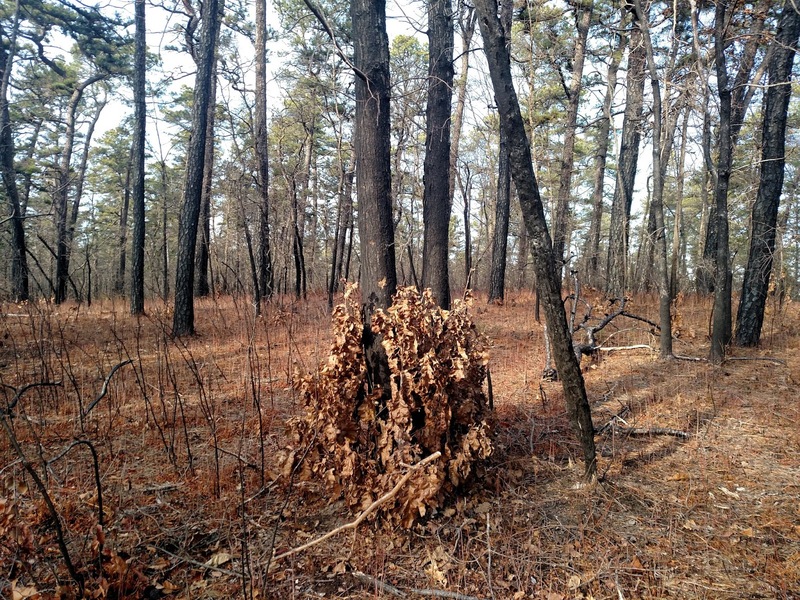 NJCF coordinates with the New Jersey Forest Fire Service to conduct prescribed burns at Franklin Parker, such as at the site pictured below in 2016. Visit the New Jersey Conservation Foundation website for more on this great organization, such as their 15 preserves throughout the state, the 26 locations they are working to save, and stopping the PennEast pipline. Site of prescribed burn from previous year. 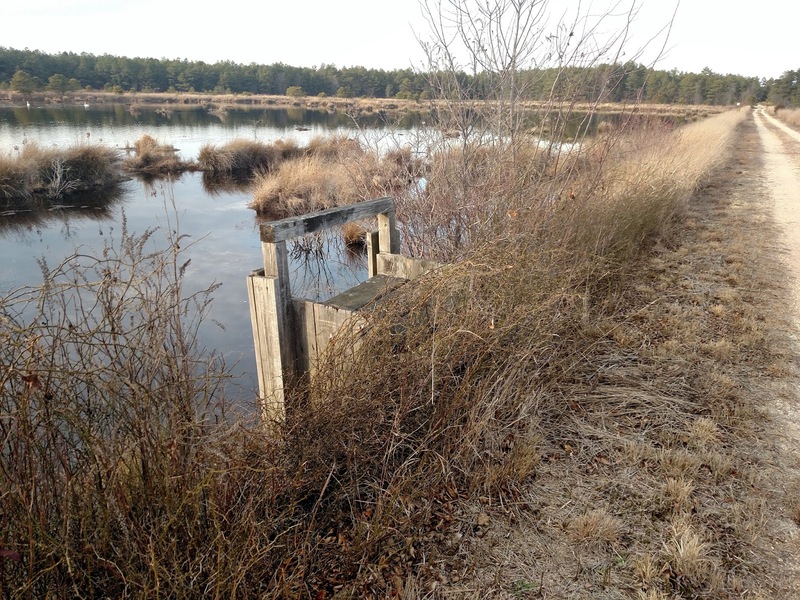 "Water Management," Pine Islands Cranberry Co.